Advent Prayers (onlineministries.creighton.edu): "In every part of our Advent days, joyful or otherwise, we can turn to God in prayer. These are suggested prayers for a variety of situations. Use them or create prayers from your own heart to meet your own needs. 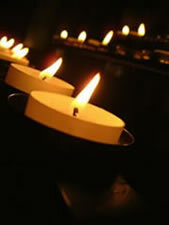 More prayers will be added throughout the weeks of Advent." Advent Wreath Blessing by Lori Veenker - Catechist Magazine: " This Advent Wreath Blessing can be used in your classroom or you can make copies of it and send it home with your students for them and their families to use. " Family Advent Wreath Prayers - " These are simply the collects from the Sunday Mass. Each night you may light the appropriate number of candles on the wreath, sing O Come O Come Emmanuel, and read the collect for the corresponding week. "